Fish are a welcome addition to many pond owners, providing hours of entertainment. However, the sudden death of pond fish may indicate a problem with the pond that must be remedied quickly to ensure the safety of the remaining fish. Water quality and the oxygen level in the water are the two most important factors for healthy pond fish. Water with low oxygen levels or high ammonia, nitrite or nitrate levels creates a potentially lethal environment. With water-testing kits available at pet stores, you can test your pond water. Gather a small sample of water, add drops of testing solution to the sample according to the instructions on the label and determine the water quality based on the resulting color change. A pH reading between 7.0 and 9.0 is acceptable for a fish pond. Ammonia and nitrite levels should be at zero, and the nitrate level should be less than 50 parts per million. If your pond is measuring above acceptable levels, you should change at least 30 percent of the pond water to freshen the pond. Fish in ponds with low oxygen levels may stay near the surface of the water in the early morning hours and have reduced appetites and activity. If oxygen in the pond is extremely low, aeration with a mechanical device such as a pump or fountain is necessary. 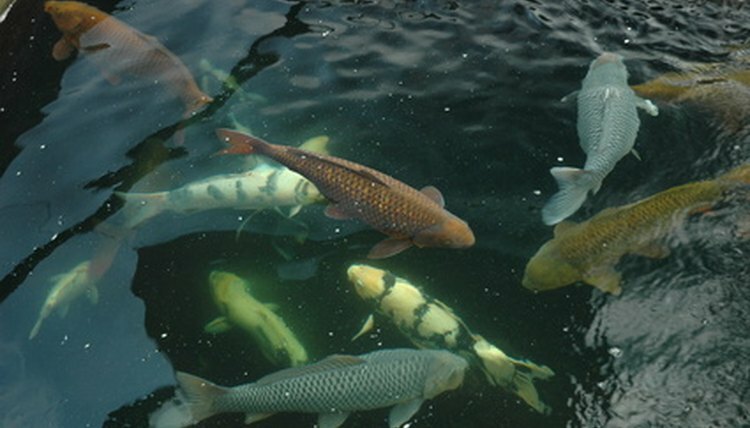 Severe or sudden water temperature fluctuations cause stress to pond fish, making them more susceptible to disease and less able to cope with other problems that may occur in the pond, such as low oxygen levels or increased ammonia levels. Frequently, the stress is too much for the fish and is fatal. Overcrowding and overfeeding, two common causes of pond fish death, create lethal situations by reducing the amount of oxygen available and by increasing the amount of waste, which then increases the ammonia and nitrite levels. Prevent overfeeding by removing any food left after five minutes. If the ammonia and nitrite levels rise above zero, the pond is overcrowded. A large amount of pond algae can kill pond fish. As a byproduct of photosynthesis, algae creates oxygen during daylight hours. Algae uses oxygen during the nighttime, which can deplete the pond’s oxygen supply if the algae blooms are large enough. In addition, large algae plants that die suddenly may be lethal to pond fish because the decomposition process further depletes the water’s oxygen. Though sometimes stress itself kills fish, more often it reduces the natural ability of the fish to overcome bacteria and viruses in the water. Signs of fish disease include reduced eating, abnormal swimming or erratic motion, sores, blisters, bulging eyes, spots or growths on the body and discoloration of the fins or body. Keeping your pond clean, well-aerated and correctly stocked helps prevent the common causes of pond fish death.